Hi there! I’m back with news about the Drools Grid Distributed Rio implementation. We will see during this post how to set up the Rio environment to run the example that I shown for Local and Remote distribution environments. For this reason this post will be divided in two main sections: Setting Up the Environment and Running and Configuring the Example. OAR Files: contains all the services that will be deployed inside the Rio runtime. In this case, we will deploy two different services: DirectoryNodeService and ExecutionNodeService. You must download both OAR files, this and this one. Demo Application: it’s the same application that we was using during the previous posts, but now it’s configured to run using the Distributed Rio Environment. (This is an updated version of the one provided in older posts. This version includes the configurations for running with distributed environments). You can download it here! Extra Maven deps: because I built both OAR files from the Drools trunk, and Rio resolve services dependencies using maven, you need to have all services dependencies inside your Maven repo. Download this zip file and uncompress it inside <user home>/.m2/repository/org/drools/. * During the following months these files will be included in the JBoss Drools Maven repo, so they will be automatically downloaded when you need them. Now you are ready to start Rio, but before that we will copy our OAR files that contains our services to the deploy directory. Now you have your services ready to be started. The last thing that you need to do is to add the dependencies from our domain classes to the Rio runtime environment. For doing this, we will copy the demo jar file into the lib directory (rio-4.1-SNAPSHOT/lib). Once you get the demo app jar inside the lib directory, you need to add it to the platform configurations to be loaded by the Rio Runtime. This will make available the domain classes for the rules that will be deployed into the remote/distributed services inside Rio. Note that in real situations, the only thing that you will add into the platform configuration will be your model jar files, not all the application classes. For adding the jar to the platform configurations you need to edit the common-platform.groovy file, located at rio-4.1-SNAPSHOT/config/platform directory. Now we are ready to start the Rio Environment. Let’s see how we can execute the demo app against the deployed services. We will also take a look at some of the tools provided by Rio. With everything set up, now it’s time to run the example. For the client side, you need to open this simple demo that create a knowledge session, insert a new fact and then fire all the activated rules. For running the example you should open the Maven project called drools-grid-mini-demo and the find the DistributedTopologyTest class. One important thing to notice is that the RioProviders doesn’t contains configurations. 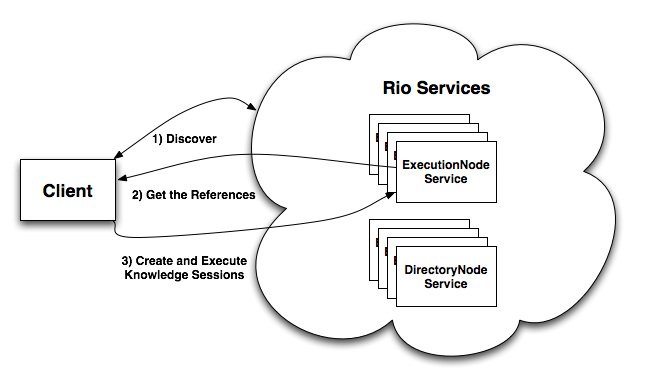 The underlaying implementation will lookup and discover Rio services in the network. As you can see in the previous figure three steps are executed in order to be able to interact with distributed knowledge sessions. 1) Dynamic process forking: with Rio we can configure that new instances of the same services must be executed in a different OS process. Rio will automatically create a new OS process on demand each time that it’s required. 2) Dynamic resources allocation: Based on resources, nodes, and machines Rio can decide to scale up or down services instances. 3) Rule Based Services Monitoring: a new Rio services called Gnostic was designed to monitor all the services running inside the Rio Grid. 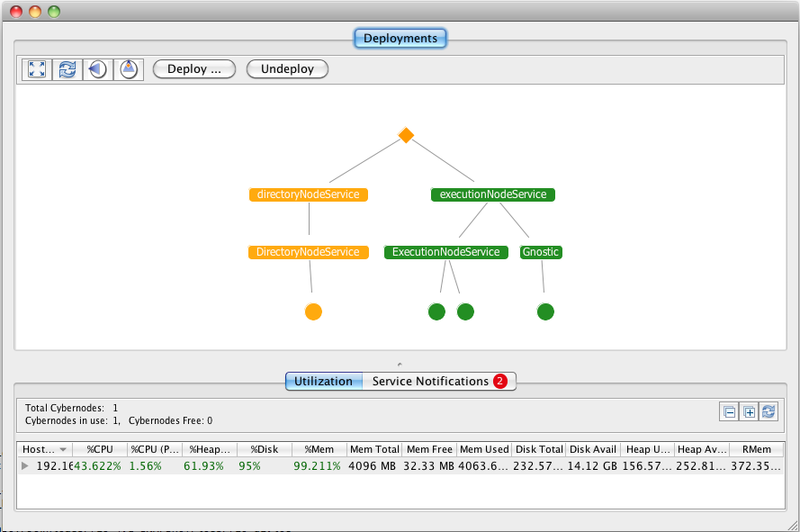 Of course, it uses Drools to define the SLA that needs to be maintained for each services. I will dedicate another blog post to describe these features, the advantages and one of the multiple approaches that we can use to design our applications using this mix of Distributed Knowledge Sessions across multiple grid services. During this post we saw how to test the Drools Grid Distributed Rio implementation. This simple example show us the main components inside the infrastructure. As you can see, these set of posts execute the same mini application using different underlaying implementations. I’m still working on details so during following posts I will go deep into more advanced configurations. Would be nice to receive feedback and questions about the proposed architecture, at the end this is community work! I will be presenting a more complete example and writing all the official documentation based on that example, so once again feedback is highly appreciated! Next Next post: jBPM 5 is out!